I am not an Iron Maiden fan. I’m not even a fan of Bruce Dickinson’s solo work. But I most definitely am a fan of Bruce Dickinson. Seems the Maiden frontman is something we don’t see much of these days. He’s a polymath. Now think about who that word conjures. Thomas Jefferson. Benjamin Franklin. Maybe Jethro Tull’s Ian Anderson, who is a fish farmer and scientist. Bruce? He’s a fencer, writer, airline pilot, entrepreneur, movie producer, and… Oh, hell, I’m pretty sure I forgot something. Oh, yeah. He plays in a band called Iron Maiden. Perhaps you’ve heard of them? As Dickinson was wrapping up his autobiography, What Does This Button Do?, he added cancer survivor to the list. And his approach to curing mouth and neck cancer was to treat it like another project, working out and carbing up before radiation and chemo treatment, researching how to attack the problem (Avoid WebMD!) and its possible root causes. ﻿ And when I say he’s a pilot, he’s a pilot, certified to fly the 737, 747, and 757, and having done test flights on the 787 and A320. He even flew Ed Force One, the zombie-emblazoned tour plane for Maiden’s later tours. Why not? He’s a captain, and he worked for the airline leasing the band the plane. The title tells you all you need to know about Bruce Dickinson. “What does this button do?” sums up his philosophy. Aviation started for him with flying lessons on a Piper Cub in Florida and led to his certification in the US and Europe on some of the biggest airliners in the world. He’s an intellectual yet a rebel. And on audio, he narrates his story with a wink and a nod, letting you know that the star of this particular show is not a god, just an average bloke who can’t stop learning new things. We should all be so lucky. And more rockers should be so smart and humble. 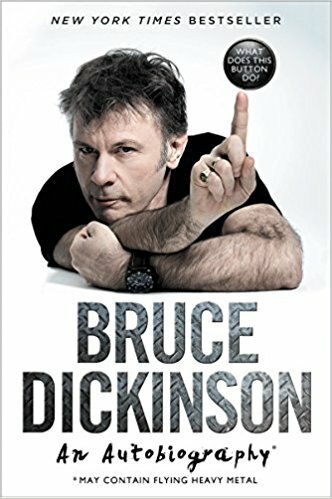 Posted in: Books, Music Filed under: Bruce Dickinson, Iron Maiden, What Does This Button Do?